In recognition of P. Diddy…just kidding. Today (March 10th) is U.S. Paper Money Day. This is one of two buildings responsible for printing the United States paper currency (coins are produced by the United States Mint in two other cities). I’d love to one day take the tour! Would definitely clear up a lot of what I saw about counterfeit money on Bad Boys 2 and Rush Hour 2. Bureau of Engraving and Printing in Washington D.C.
My ex-before-last and I had just snapped photos of the Washington Monument and were en route to the Thomas Jefferson Memorial. The enormous 3-panel sign depicting segments of a dollar bill at the entrance is no less than 24 feet tall. That’s D.C. for ya! Korean War Veterans Memorial in D.C. 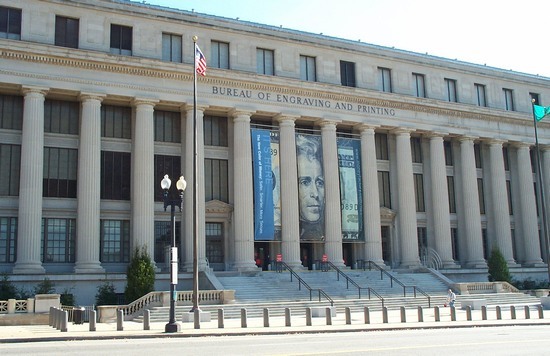 Tags: Bureau of Engraving and Printing, Washington D.C.